So you’re heading to Bend. You probably already have a bucket list of activities to do in Bend while in town. In case you need some more ideas, we’ve thrown together an ultimate list of top things to do in Bend, Oregon. You can pretty much head out of town in any direction and find great opportunites for hiking. Heck, you can even walk directly from town and head along the Deschutes river trail for a quick dose of nature. Some other top day hikes in Bend include the must-see 89-foot cascading Tumalo Falls, a family friendly loop in Shevlin Park, hiking Tumalo Mountain for a panoramic view of Central Oregon, or for those up for a challenge—hiking the 12-mile roundtrip climb to the top of South Sister. For those visiting Bend during the Winter, carving up the slopes of Mount Bachelor is a must. Just 22 miles up Cascade Lakes Scenic Highway Mount Bachelor Ski Resort is easily reached from Bend. Mount Bachelor is one of Northwest’s largest ski resorts with over 3,365 feet of vertical drop and 4,000 skiable acres. It features 101 ski runs with a great variety for all levels, making it perfect for family ski days and black diamond seeking adrenaline junkies. The ski season typically starts by Thanksgiving and runs well into the spring thanks to the generous PNW snowfall it receives. The resort receives an average annual snowfall of 462″ placing it at No. 34 in North America for its total average snowfall. The resort offers rentals, lessons, a tubing hill, dog sled tours, and a Nordic ski center for those looking for something else than alpine skiing. With it’s ever-growing trail network, Bend is almost synonymous for mountain biking. With it’s first trails founded in the 1980’s, Bend has slowly turned into one of the top mountain biking meccas of the US. Just how many trails are in Bend do you ask? I couldn’t pinpoint an exact number, but you would be hard-pressed to ride the same trail twice after two weeks of mountain biking in Central Oregon. Unless of course, you wanted to do laps on the incredibly popular Whoops trail. Read up on our ultimate guide to mountain biking in Bend. If you are mountain biking in Bend for the first time, I’d recommend heading to Phil’s trail complex where you can enjoy endless miles of flowy, pristine single track through weaving through Ponderosa trees. When you feel the need to branch out, there are plenty of other options for mountain biking around Bend. 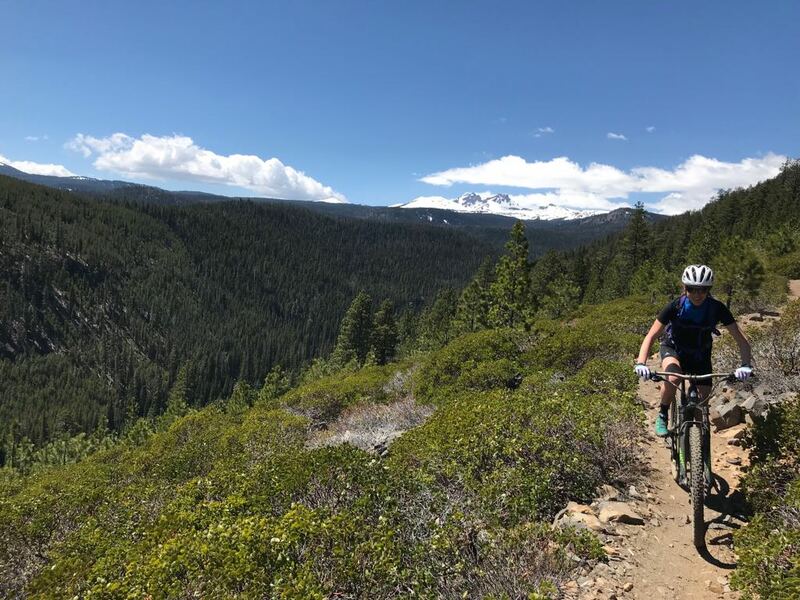 Head South to ride along the Deschutes river trail, head North to ride the Maston trail complex, head East in the winter to explore Horse Ridge, or drive up Cascade Lakes Highway to ride some high alpine trails once the snow melts off. Some top trails to ride while in town include Phil’s Trail, Whoops, South Fork, Mrazek, and Flagline. Bend’s quaint downtown is lined with local shops, cafes, and restaurants that can easily fill an afternoon or two or exploring. For shopping you’ll find a mix of local clothes boutiques, a few art galleries, jewelry shops, the Bend Store, and a few larger brand name shops such as Patagonia. When hunger strikes there are plenty of choices for dining from gourmet restaurants to quick bites. 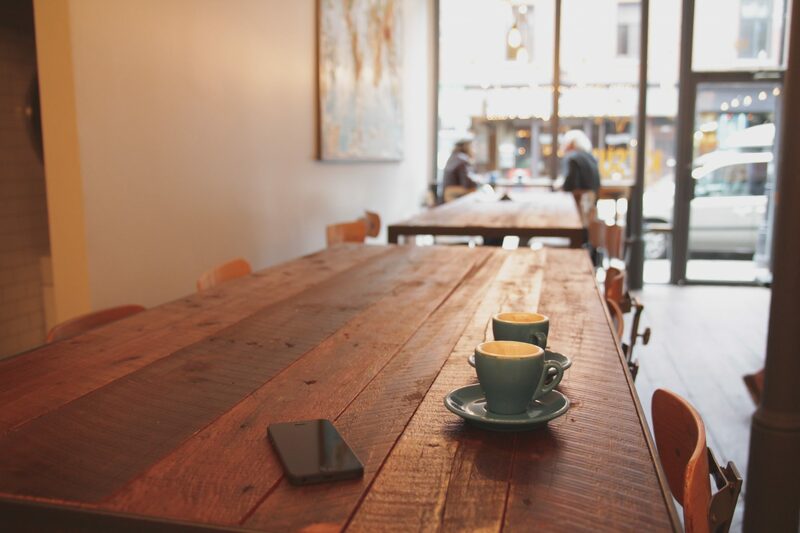 Check out our our full list of the best coffee shops in Bend. If you are looking for Portland-quality coffee, Bend holds it’s own with numerous local coffee roasters even more coffee shops to get your caffeine fix from. Head to Lone Pine Coffee Roasters if you are looking for a small-batch bean roaster, try out Backporch Coffee Roasters or Thump Roastery for a great place to meet friends or work as a digital nomad. The Sparrow Bakery – Make sure to try an Ocean Roll! Spoken Moto – Hip and relaxed. Ideal for getting work done. Food carts outside. Live music on some nights. During the summer, hitting water at the Deschutes is a must. The river offers a mellow cruise for stand up paddle boarding. Best best place to in your board is at Riverbend Park or McKay Park. From both parks you can safely cruise up or down river and enjoy cooling off in the Deschutes. If you need to rent a stand up paddle board, you can do so directly at River Bend Park during the summer or from Stand On Liquid or Tumalo Creek Kayak & Canoe. One of Bend’s biggest assets is the Deschutes River Trail that stretches 12+ miles through the heart of Bend. Following the Deschutes River for its length the trail offer breathtaking views and an easy escape to enjoy nature. As the trail meanders through Bend there are many options for accessing this trail, including Farewell Bend Park, Riverbend Pioneer Park, Sawyer Park, and McKay Park. The trail offers anything from a leisurely stroll to a longer trail run. As the trail traverses through the city of Bend you’ll find neighborhoods, shops and restaurants at the Old Mill District and beautiful scenery to explore. If you are seeking nature, the trail progressively gets more wild at it’s southern and northern ends. Don’t expect a stuffy, indoors museum when planning a visit to Bend’s High Desert Museum. This museum will make all other museums your been to look look pale in comparison. The High Desert Museum is part living, part outdoors, and incredibly engaging. It’s a great way to learn about local history, flora and fauna, and more. That’s why it’s one of the best things to do in Bend with kids, but trust me, as a parent you will also thoroughly enjoy the visit. Looking for more museums in and near Bend? Some exhibits the museum features include an outside area with living local animals such as porcupines, river otters, birds of prey, a life-like historic walk-through exhibit depicting what life was like as a pioneer, and great volcanic and geologic history of the Central Oregon area. After visiting the High Desert Museum it will be clear why it’s one of the top bend attractions to see with kids. The volcanic history around Central Oregon is ever present. A great way to witness it first hand is to explore underground with a journey into an extinct lava tube. Formed over 80,000 years ago Lava River Cave was only discovered in 1889 by a local pioneer hunter. At 5,211 feet long this natural cave is the longest continuous lava tube in Oregon and can be explored on foot by entering through a 126 step descent. The average temperature in Lava River Cave is 42 degrees, so be sure to pack a warm jacket, flashlight, and wear closed toe shoes if you plan on entering the cave. A short drive South of Bend will land you smack dab in the center of volcano country at Newberry National Volcanic Monument. Don’t let this inconspicuous volcano fool you, stretching over 1,200 square miles (roughly the size of Rhode Island) the Newberry Volcano is the largest in the Cascade Volcanic Arc. Here you can witness these unique geologic structures that were formed around 75,000 years ago when the Newberry Volcano erupted. The eruption left behind the 5 mile wide Newberry caldera which can be seen in whole from the top of Paulina Peak which can be reached via a difficult hike and car in the summer, and snowmobile in the winter. Some top sights to visit at Newberry National Volcanic Monument include the informative Newberry Welcome Station, the 80-foot double waterfall of Paulina Falls, the lodge at Paulina Lake, soaking in the hot springs along the edge of East Lake, and taking a journey into the past through the jagged volcanic glass obsidian flow. If you have extra time, the area around Newberry National Monument offers endless opportunity for biking, hiking, camping, swimming, and fishing. 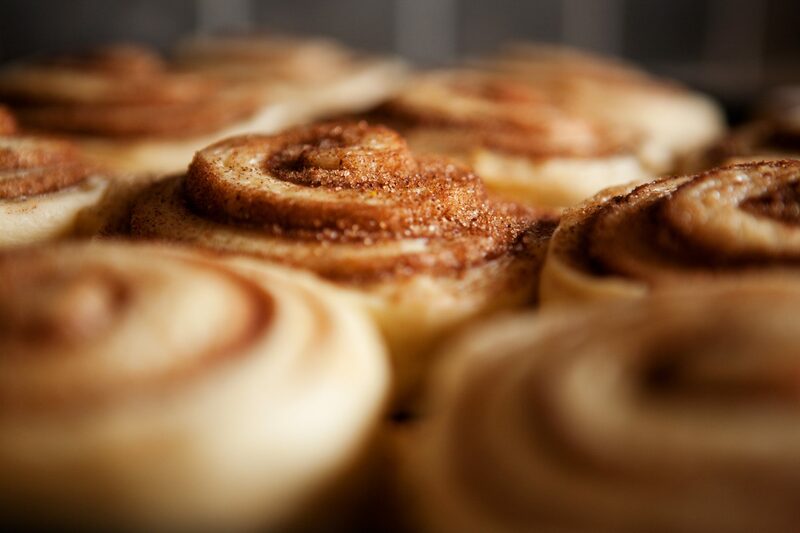 What started out as an innocent pastry is now an icon of Bend. It’s fame reaches far and wide, you may have even heard of an Ocean Roll before visiting Bend. Read our guide to the best bakeries in Bend! The Sparrow Bakery is the creator of this extremely popular pastry which is a cross between cinnamon roll and croissant with some extra spice thrown in with some cardamom. All this comes together as a rich, buttery roll with a kick of cardamom that will ultimately blow your taste beds socks off. Indulging in an ocean roll is a must while visiting Bend and you can find them around town at The Sparrow Bakery, Backporch Coffee, and other coffee shops. But a word for the wise, these things tend to sell out like hot cakes, so be sure to grab yours early. As the tallest waterfall in Central Oregon, Tumalo Falls is a very popular sight to visit—and rightly so given it’s beauty and close proximity to Bend. The short hike to Tumalo Falls is a great way to spend the afternoon. You can venture further up Tumalo Creek along the North Fork Trail or pack a picnic and enjoy the views. Read our insiders guide to hiking Tumalo Falls! If you are just going to view the falls it’s just a short hike to the viewing platform from the parking area. The parking area is managed by the USDA Forest Service, so you will need a Northwest Forest Pass or you can buy a $5 daily parking permit. Insider Tip: If you are interested in a longer hike we highly recommend continuing up the North Fork Trail to reach Happy Valley. You’ll get spectacular views of several more waterfalls along the way before reaching a meandering stream running through a meadow, know as Happy Valley. Read our complete guide to snowshoeing in Bend! Once Central Oregon turns into a winter wonderland there are endless snow sports to be enjoyed. One of our favorites is snowshoeing into one of the many shelters within Deschutes National Forest. 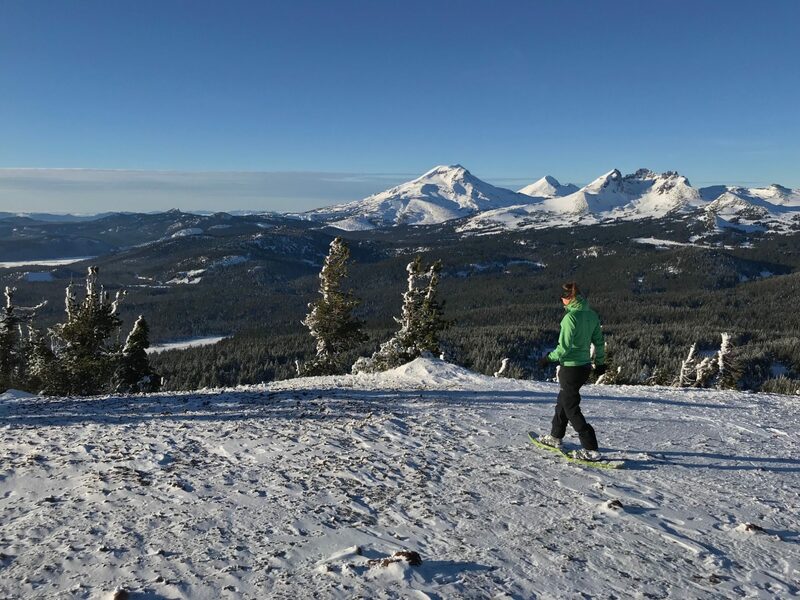 Tumalo Mountain – If you are looking to gain to vertical, Snowshoeing up Tumalo Mountain is just that. The trail takes you 2-miles uphill to the summit where you are rewarded with excellent panoramic views of the Three Sisters and Central Oregon high desert. Swampy Lakes Sno-Park – Half-way up Cascade Lakes Highway on the way to Mount Bachelor you’ll pass Swampy Lakes Sno-Park. There are many small loops for explore on snowshoe and for a longer hike you can reach Swampy Lakes Shelter. Virginia Meissner Sno-Park – One of the closest areas to Bend for snowshoeing. This sno-park is popular with Nordic skiers, but also has a snowshoe loop. Skyliner Sno-Park – Another popular place for Nordic skiing and snowshoeing. Another option is to drive a little bit farther up Skyliners Road and park just after the bridge crossing Tumalo Creek. From here you can snowshoe in to Tumalo Falls along the snow covered road. If you are looking for Oregon grown produce and local treats, the Bend Farmers Market is the place to head. With three locations—the downtown market, the East-side market, and in Northwest Crossing Farmers Market—you can easily pick up everything from local meat, dairy, baked goodies, and Oregon grown produce. 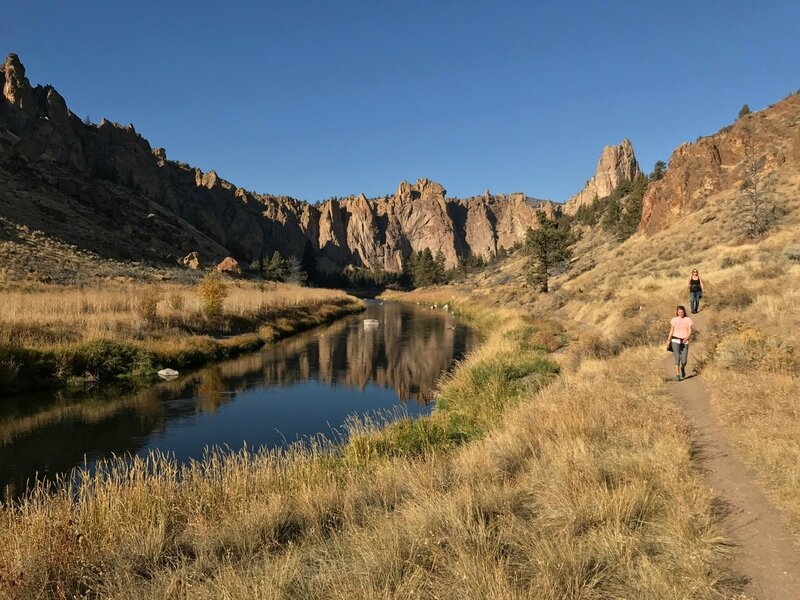 If you are looking to escape it all and find solitude in the high desert, head East of Bend to explore the vast and wild Oregon Badlands Wilderness Area. With 29,180 acres of rugged lava flows, twisted juniper trees, sagebrush and ancient geologic features you can fill days exploring the many sights within the area. Some of our favorite spots to check out include Dry River Canyon, Horse Ridge, and Badlands Volcano. Keep your eye out for wildlife including mule deer, antelope, yellow-bellied marmots, and bobcats. Traces of human history can also be found among the landscapes, with one of the most interesting being Native American pictographs within Dry River. A scenic drive along Cascade Lakes Highway offers magnificent views along the way and plenty of opportunities for hiking and paddling in the many lakes. Head out of Bend along Cascade Lakes Scenic Byway towards Mt Bachelor where you can continue on to see views of South Sister and Broken Top. Continuing further will take you past Todd Lake, Sparks Lake, Devils Lake, Elk Lake, Hosmer Lake, and Lava Lake. For a longer journey you can make a loop back to Bend by turning towards Sunriver on NF-40 and driving back up the Sunriver cutoff to Cascade Lakes Highway or passing through Sunriver to Highway 97. First let’s point of that since you’re in Oregon you can shop tax-free. You’ll find great local shops downtown Bend, larger brand stores at the Old Mill District, and outlet stores at the Bend Factory Stores. Plus, these are all within 10 minutes of each other so you can hit them all in one day. 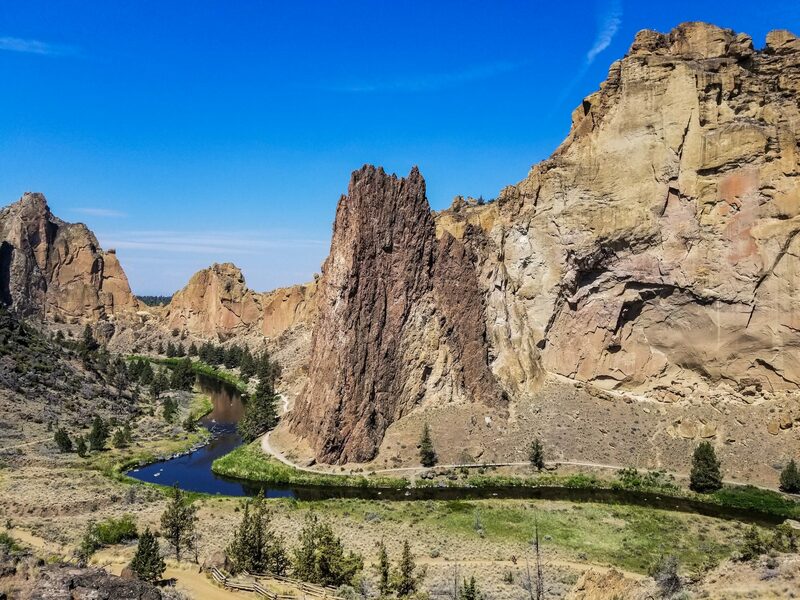 Listed as one of the 7 wonders of Oregon, Smith Rock State Park offers stunning landscapes to explore. Known as one of the birthplaces of American sport climbing, Smith Rock State Park continues to draw world-class climbers to scale it’s iconic volcanic rock spires. With more than a thousand bolted routes there are climbing options for ever level of climber. And don’t worry, if you’re not a climber the parks offers plenty of other great outdoor adventures including hiking, biking, and photography. One of our favorite hikes is to head up Misery Ridge (aptly named for a reason!) to be rewarded on top by panoramic views overlooking the rim of Deschutes River flowing through the towering pillars of rock. From here you can continue down the other side past Monkey Face spire and return back along the scenic River Trail. Situated at the banks of the Deschutes River, the Les Schwab Amphitheater is the perfect place to watch a concert while visiting Bend in the summer. The venue is outdoors and has open seating on a large grass berm facing the stage. There is plenty of room to stroll around or find the perfect spot to post of with your lawn chair or blanket. Tickets often sell out fast for big headliners, so you’ll want to grab then early. You can take a look at the calendar to see who is going to be playing in town this year. There are also several free summer concert series that at the Les Schwab Amphitheater that are a great way to get our and listen to some tunes. So now you don’t have an excuse to grab a local brew, sit back, and enjoy music by the river. 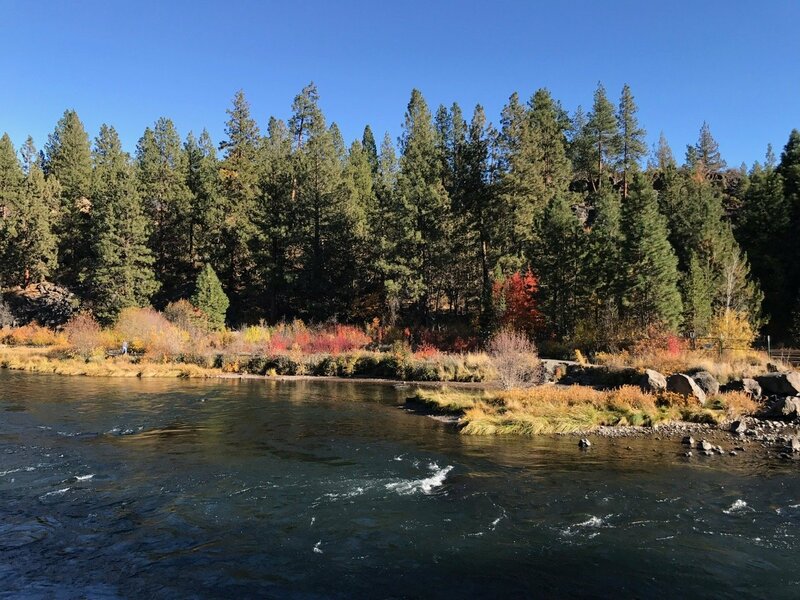 With over 50 places to go fishing within 90 minutes of Bend it’s easy to see why Fly-Fisherman Magazine rated it as one of the Top 10 ​fly-​fishing towns in the United States. With numerous rivers, lakes, stream flowing down from the Cascade Mountains there are endless options for anglers and fly fishers alike. The world renowned Deschutes River offers 252 miles of fishable waters and has established itself as one of the premier fly fishing rivers in the Pacific Northwest. Head west of Bend into the Cascade Mountains to fish Redside Rainbow Trout along the Deschutes pristine, snow fed headwaters. Or follow the Deschutes downriver and fish the highly sought after spots for big Wild Trout and Pacific Steelhead. Where you head, with so many great fishing spots within reach, Bend is simply a fisherman’s paradise. It’s said that good things come in threes—with Bend it’s amazing trails, great coffee, and tasty beer. Check out our full list of breweries in Bend! With over 23 breweries in Bend, Oregon it’s hard to deny that this city is serious about making great beer. Whether you are seeking the hoppiest IPAs or darkest porter, you’ll find it at one of Bend’s breweries. 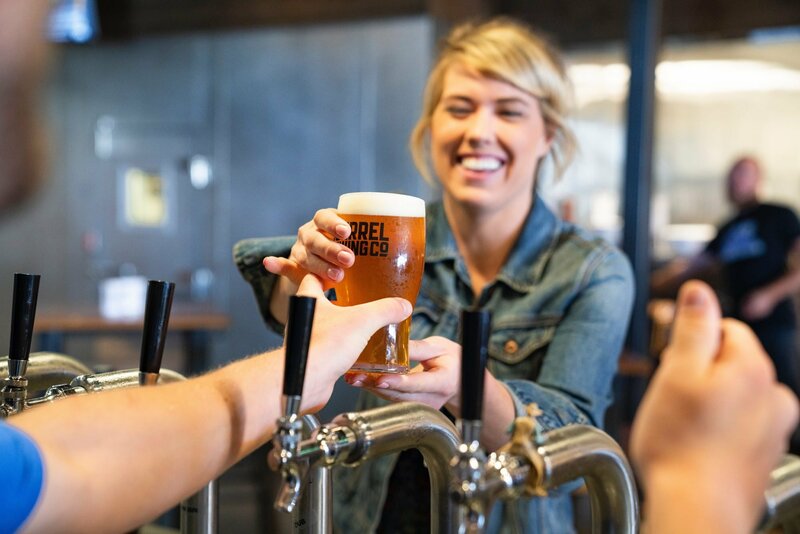 Venturing along the famed Bend Ale Trail is a great way to explore local brews. Let’s run some numbers…Bend’s population is roughly 94,520 people, that means there is one brewery for every 4,109 residents. Not bad! May the only problem you have while visiting Bend be finding an excuse not to crack open a cold one after a long day of hiking, biking, climbing, skiing, or any other outdoor adventures. And if your not keen of kicking back in a local pub, just fill up your growler at one of Bend’s many growler fill stations.